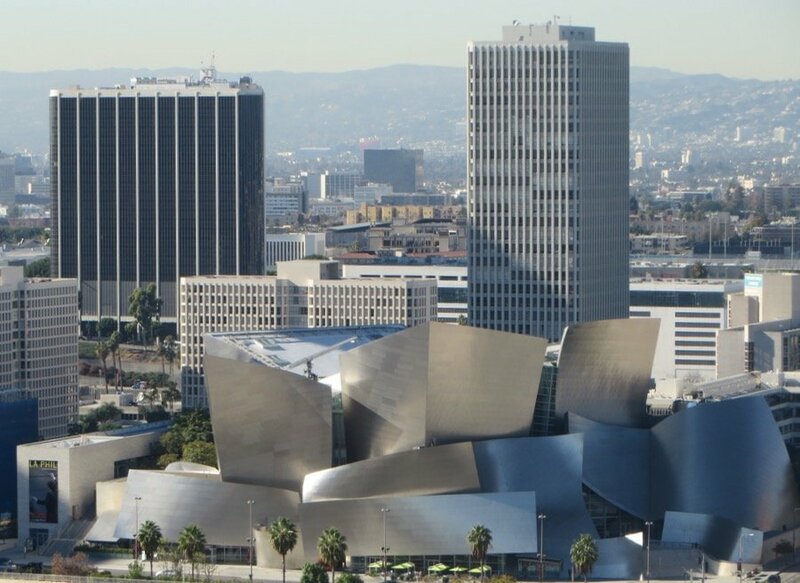 Los Angeles is the focus of a sprawling metropolitan area with widespread places like Hollywood, Santa Monica, and Pasadena, all connected by the infamous freeways. But walking around downtown Los Angeles, no car required, is a fun way to spend a day in this auto-centric city. 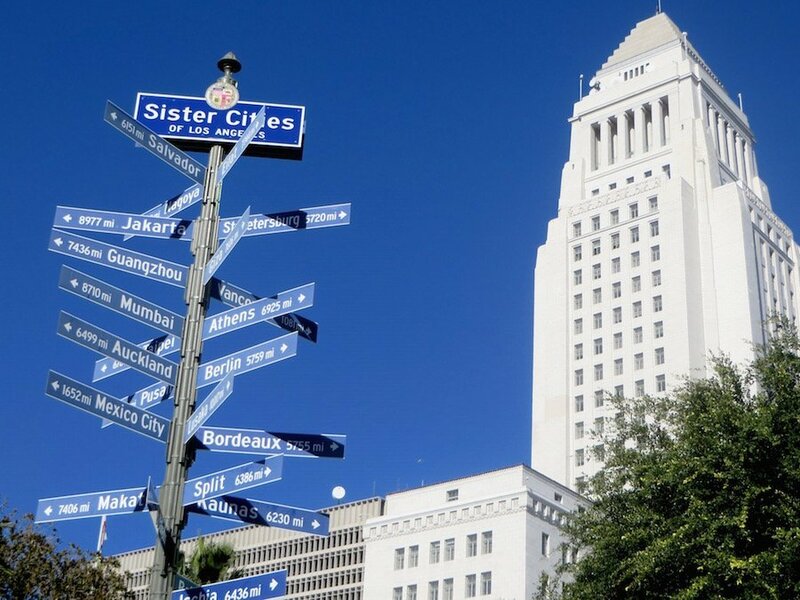 L.A. also boasts an interesting downtown core, one that many Angelenos have never even visited. 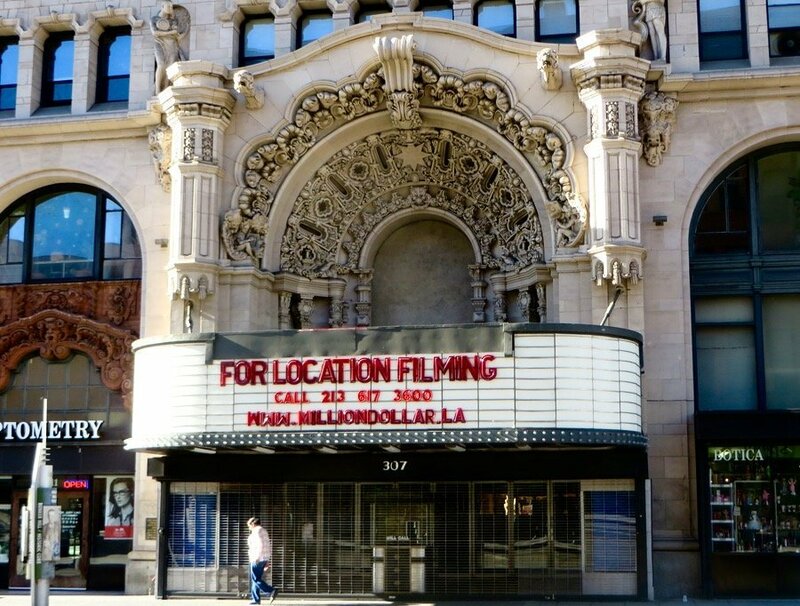 Many movies have been filmed in downtown Los Angeles. 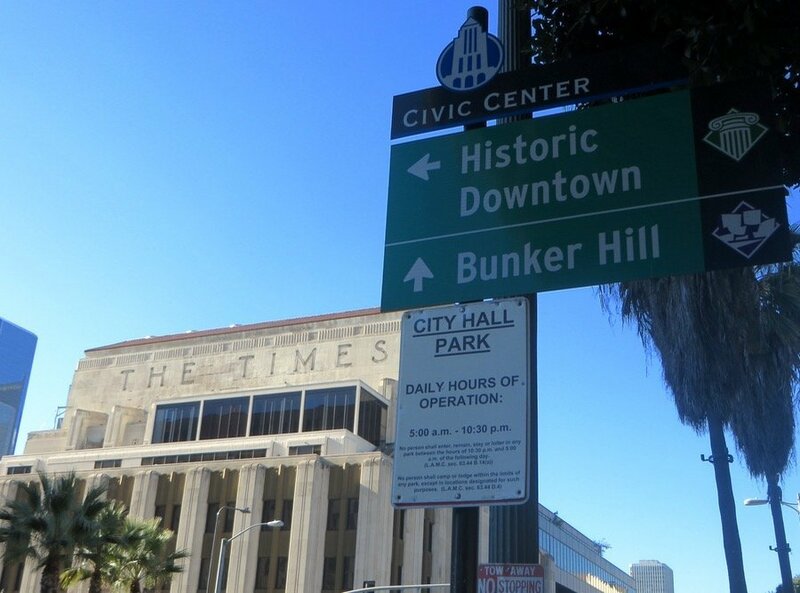 To help film buffs figure it all out, helpful signs point out which buildings have had scenes shot there. 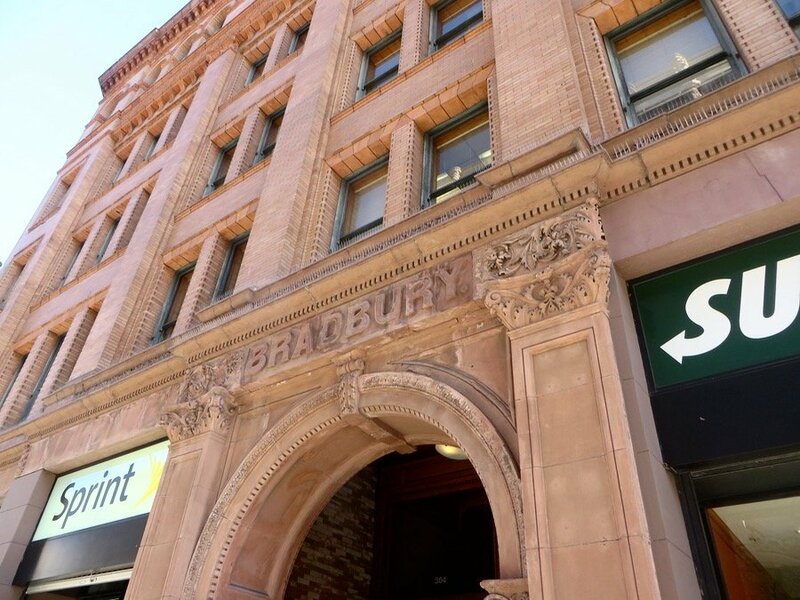 One sign notes the circa 1893 Bradbury Building pictured above and located at 304 South Broadway. It was featured in many movies, the most prominent of which is Blade Runner where it hosted many of the moody interior shots. No doubt the movie’s producer’s enjoyed the tongue-in-cheek coincidence with sci-fi author Ray Bradbury’s name. Pictured below is the 1918 “Million Dollar Theatre” done up in Spanish baroque style at 307 South Broadway. 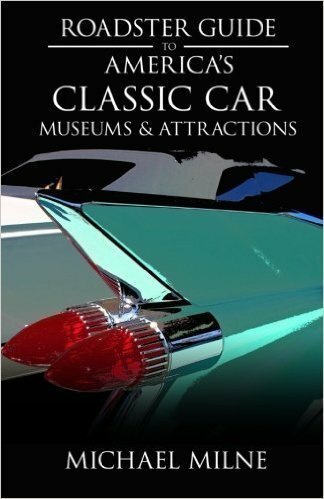 It can also be seen in Blade Runner as well as the Academy Award winner The Artist. 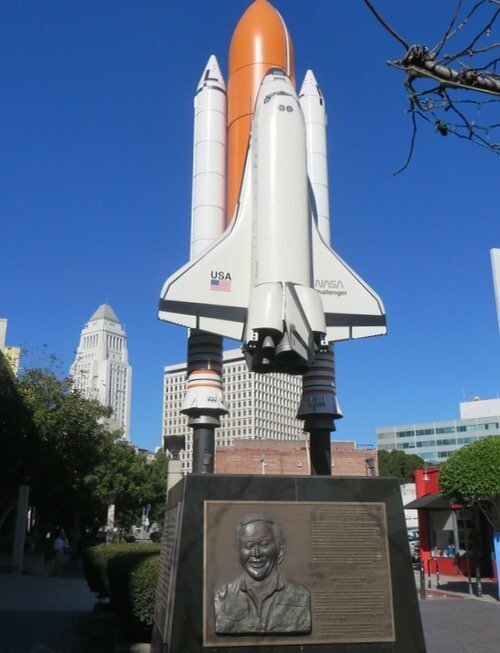 This poignant statue to the Space Shuttle Challenger stands in the Little Tokyo section of downtown Los Angeles as a memorial to astronaut Ellison Onizuka. The 1/10th scale model of the Space Shuttle Challenger is 27 feet tall. One bronze commemorative plaque is dedicated to Onizuka while other plaques are dedicated to the Challenger crew and the United States Space Program. Location: Astronaut Ellison Onizuka Street. Near the intersection of East 2nd Street and South San Pedro Street. 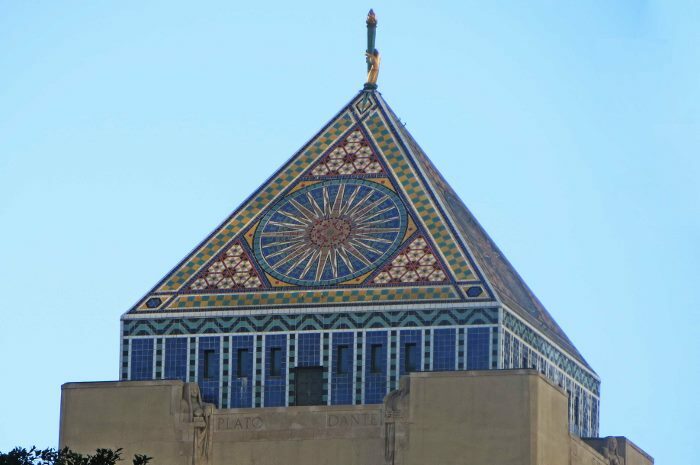 This 1928 building boasts an observation deck that’s probably one of the best-kept secrets in Southern California. (Seriously. 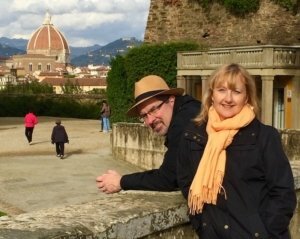 We spoke to lifelong residents and even a reporter from the Los Angeles Times who had never heard of it.) 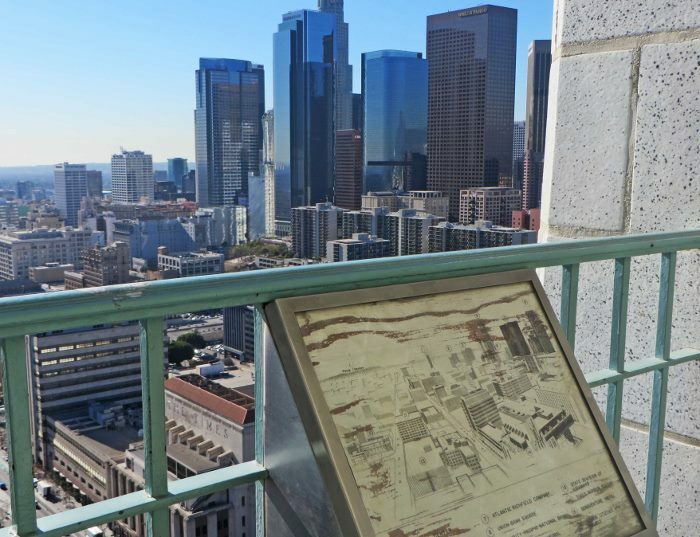 The 27th-floor deck offers a 360-degree view that includes the Hollywood sign, the Pacific Ocean, the wonky Frank Gehry designed Walt Disney Concert Hall and more. Location: 200 North Spring St. 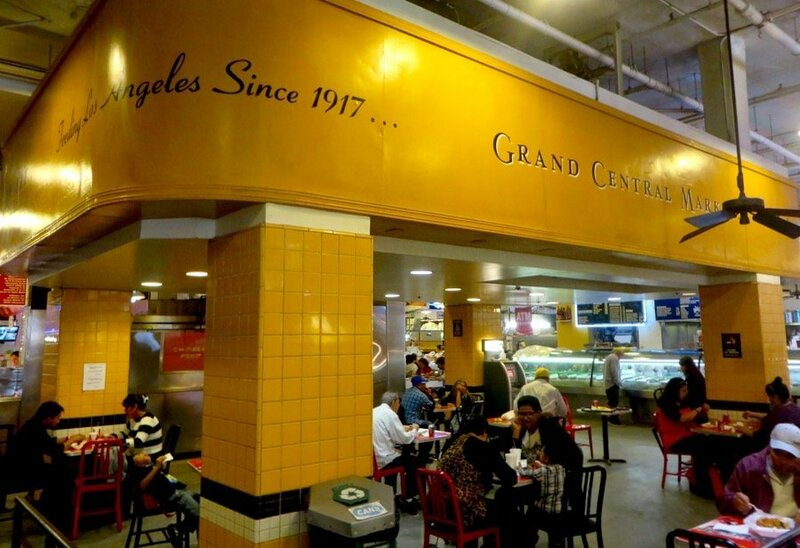 Serving the city since 1917 as an anchor for the area, this enduring standby dishes it up for the growing downtown residential population with a global mix of 90 food and restaurant stalls. Our favorites include the authentic Berlin Currywurst stand and to fill my carb fetish, a crispy baguette from Clark Street Bread. 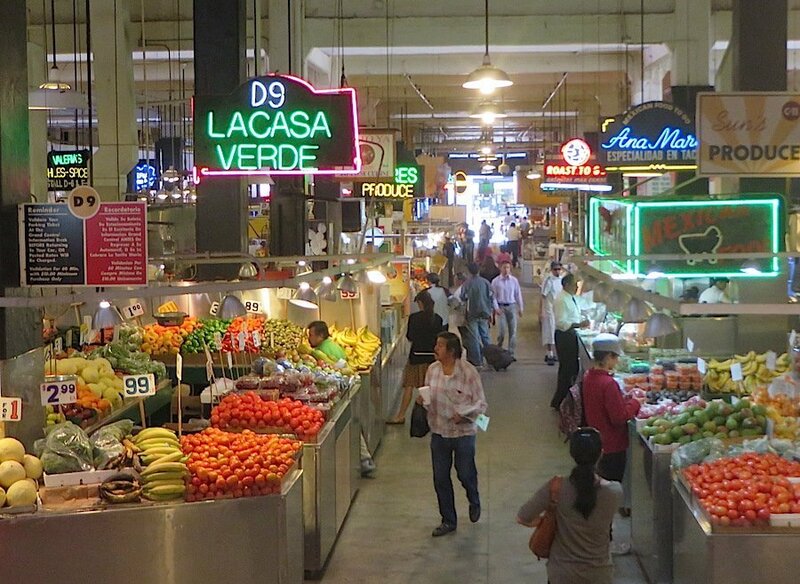 For a complete list of vendors go to Grand Central Market. 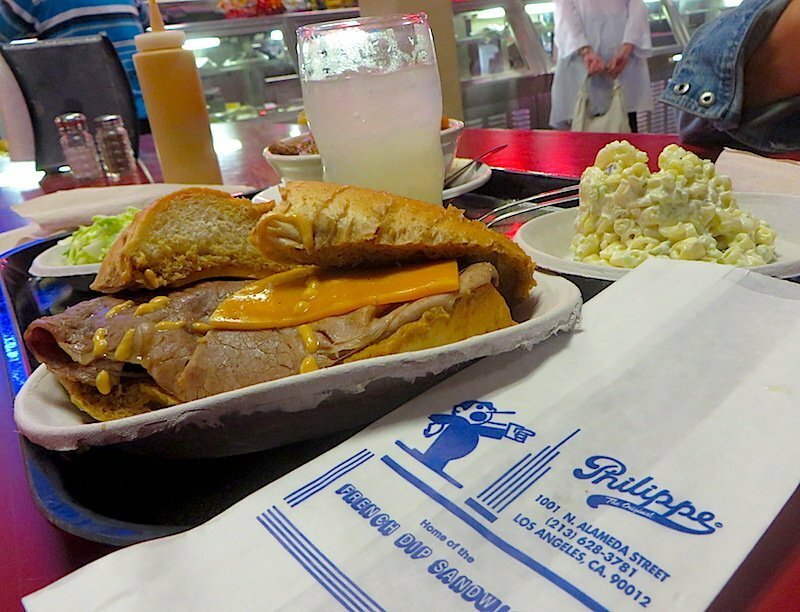 A total throwback restaurant that is pure L.A., Philippe’s has been serving up French dip roast beef sandwiches since 1918. 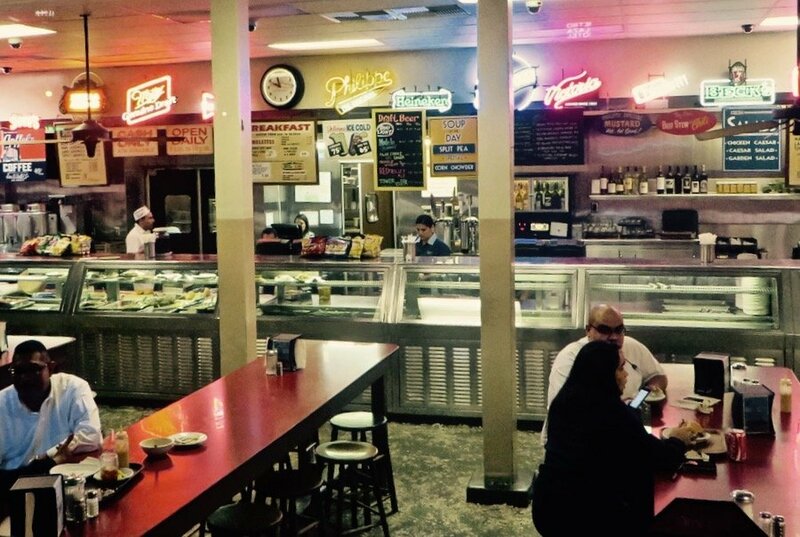 The pricing and atmosphere (think aluminum counters and sawdust on the floor) are retro, as well. There’s even a small museum dedicated to the Los Angeles transit system in the back. 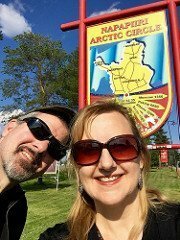 The prices were so low for beverages, 75 cents for lemonade and 65 cents for iced tea, that we thought those were vintage signs from the ’60s. 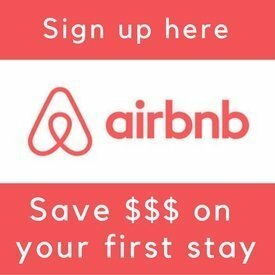 Location: 1001 North Alameda St. 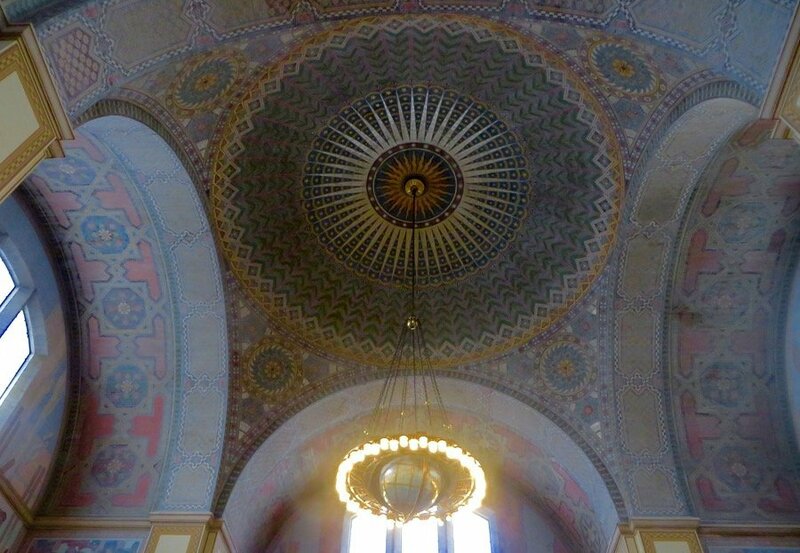 Which downtown Los Angeles sights do you recommend?